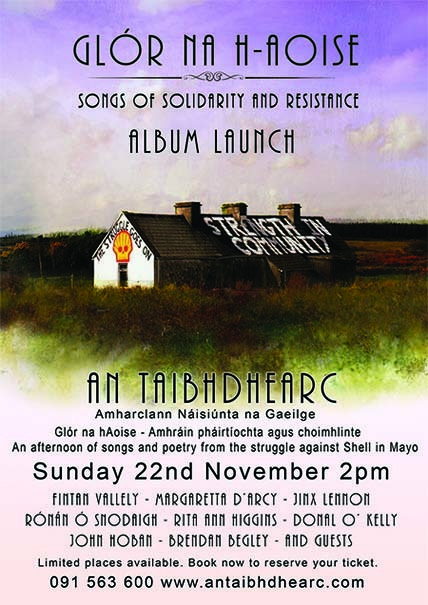 On November 22nd at 2pm Galway city will be the location of a gala concert celebrating the release of GLÓR NA H-AOISE - SONGS OF SOLIDARITY AND RESISTANCE, a collection of music and poetry which celebrates over 15 years of struggle against Shell in Mayo and the links forged there with communities such as the Ogoni. 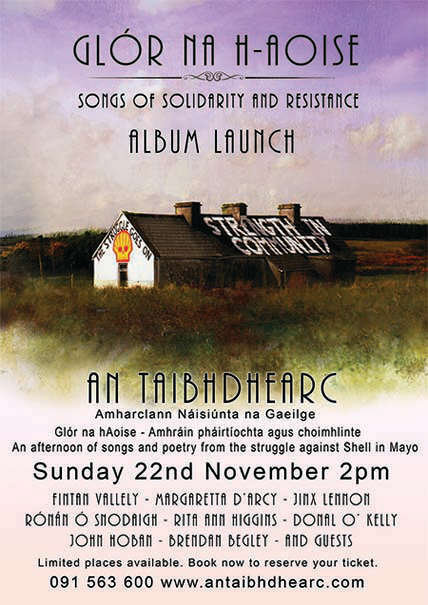 GLÓR NA H-AOISE - also known as the SONGS FOR ROSSPORT PROJECT - is an album of songs and poems inspired by or in support of the Shell to Sea campaign and the struggle to have the Corrib refinery relocated away from Ballinaboy. From the jailing of the Rossport Five to the sinking of Pat O'Donnell's fishing boat, from the road protests at Ballinaboy to the arrival of the Tunnel Boring Machine, the important moments and key themes of the campaign are remembered here in poem and song. 'Glór na h-Aoise' promises to be an inspirational collection which celebrates with dignity and humour the hard truths of the struggle against Shell. The concert will feature performances from John Hoban, Brendan Begley, Ronan O'Snodaigh, Fintan Vallely and Jinx Lennon to name but a few. Poets Rita Ann Higgins, Sorcha Fox, Margaretta D'arcy and Louis de Paor will recite from their contributions to the collection and actor Donal O'Kelly and storyteller Aindrias de Staic will be among those also participating in the celebrations.